How much is J. J. Watt Worth? JJ Watt Net Worth and salary: JJ Watt is an American professional football player who has a net worth of $10 million. JJ Watt was born during the spring of 1989 in Waukesha, Wisconsin. He played college football for Central Michigan University before transferring to play for the University of Wisconsin Badgers, where he earned All-American honors. Watt had a breakout season in 2010, winning the Lott Trophy and being named the team's Co-MVP of the year. The Houston Texans drafted Watt with the eleventh overall pick during the first round of the 2011 NFL Draft. He has since gone on to be one of the most dominant defenders in the NFL. Watt, a six-foot-five, 289-pound defensive end, was ranked in the top 15 of the best 100 players in the NFL in both 2013 and 2014. He is a three-time AFC Defensive Player of the Month, a two-time All-NFL and All-AFC team member, and the 2012 PFWA Defensive Player of the Year. 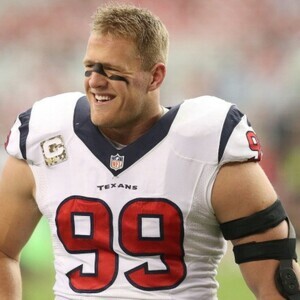 Watt led the NFL in sacks in 2012 en route to winning the Associated Press' NFL Defensive Player of the Year award and the AFC Defensive Player of the Year award. 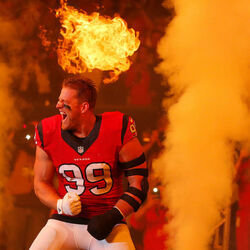 Watt is a two-time first-team All-Pro (2012, 2013), and has been to two Pro Bowls (2012, 2013) in his young career. Through four weeks of the 2014 season, Watt has amassed 243 career tackles, 40.5 quarterback sacks, 83 defended passes, eight forced fumbles, one interception, and one receiving touchdown. Watt, who signed a contract for six years worth up to $100 million in the fall of 2014 with Houston, is heavily involved in several charitable efforts in Wisconsin and Texas. When Did J.J. Watt Become The Most Valuable Player In The NFL (Financially And Athletically)?